A new study by botanists at the LMU shows that, in most woody plants in the northern temperate zone, leaf emergence (leaf-out) in spring is not regulated by day-length but instead by spring temperature and the cumulative exposure to cold days. Temperature or day-length – which of these two environmental factors is responsible for triggering leaf emergence in spring? The answer is important for predicting how climate change will affect vegetation at temperate latitudes. The conventional assumption is that higher temperatures will promote earlier leaf emergence and extend the growth period of plants by allowing more carbon to be converted into biomass. However, leafing out is not always dependent on temperature alone. Day-length (photoperiod) can also play an important role – and will not be altered by climate change. Hence photoperiod could reduce the impact of rising temperatures on species in which it is the primary determinant of the timing of leafing out. "In most woody plants, it was unknown whether leafing out is controlled primarily by day-length or by temperature, preventing the development of mechanistic models that would allow us to predict the effects of climate change on leaf emergence at least in the temperate zone.“ says LMU botanist Professor Susanne Renner. She and her research group have now carried out a large-scale study, which sheds light on this issue. The findings are reported in the journal Nature Climate Change. 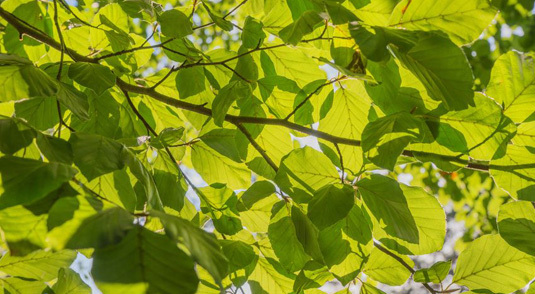 Under laboratory conditions, the researchers exposed twigs of 173 woody plant species that occur naturally in the northern temperate zone to different photoperiods, and observed the effects on leafing out. The twigs were collected at the onset, the middle, and the end of winter from individuals from many genera and families growing outdoors in the Munich Botanical Garden. The results show that in the majority of the species tested – 65% to be precise – day-length had no influence on the date of leaf emergence. In the rest of the species examined, the influence of light on leaf-out decreased with the number of cold days to which the species had been exposed before the twigs were collected. In only four species – including three species of beech – was day-length found to be a crucial factor under all conditions tested. According to Renner and her colleagues, the results correlate with the climatic conditions that now prevail in the native habitats of the plants: All the species in which day-length plays a prominent role in determining the date of leaf-out are found in the more southerly reaches of the northern hemisphere’s temperate zone, where winters are mild. Conversely, all species that rely on spring warming as their leaf-out signal come from more northerly regions with longer winters, where the mean temperature lies below 5°C for 7 months of the year and where coldness suffices to ensure that the plant will remain dormant. “In addition, in the more northerly climates, increasing day-length does not necessarily signal the absence of frost,” says PhD student Constantin Zohner, the first author on the paper. “The critical period for perception of day length signals occurs around the spring equinox at the end of March, when the rate of increase in day-length reaches its peak. In northern regions, however, that is much too early for it to serve as a reliable indicator of the onset of frost-free conditions.” The researchers therefore infer that day-length is likely to constrain earlier leafing out in woody plants only in the milder regions of the Northern Hemisphere – unless species that utilize day-length as a trigger extend their ranges northward in response to rising temperatures. Given that the mean date of the last spring frosts in Germany is now two weeks earlier than it was in 1955, the latter assumption is a realistic possibility.